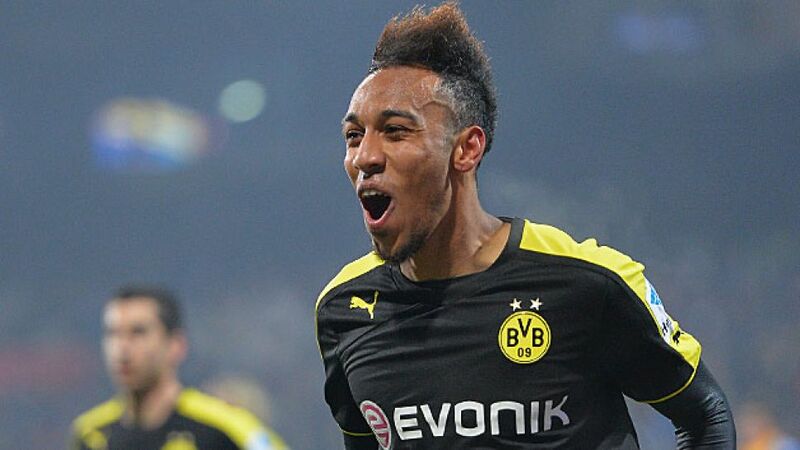 Braunschweig - Pierre-Emerick Aubameyang returned Borussia Dortmund to winning ways as his brace secured a 2-1 win at bottom-placed Eintracht Braunschweig. Aubameyang's goals sandwiched a Benjamin Kessel effort and, though Braunschweig went close to snatching a point late on when Ermin Bicakcic hit the post, Dortmund survived the late scare to put an end to a four-game winless streak. Eintracht Braunschweig were clearly among the millions of spectators on Wednesday night watching how VfB Stuttgart boldly took the game to a seemingly invincible FC Bayern München – they adopted the same fearless approach to another of the Bundesliga's apparent untouchables in recent years. For the first 15 minutes of the game, Dortmund found themselves on the back foot and struggled to get into their groove. Torsten Lieberknecht's men, inspired by the increasingly effective winter signing Havard Nielsen, had not only taken over Dortmund's habitual yellow attire, they had also assumed their attacking prowess. Jan Hochscheidt advanced with the ball at his feet and, as space opened up in front of him, he sent in a shot which, by virtue of a deflection off the foot of Mats Hummels, gave Roman Weidenfeller some early work to do. Kessel went even closer with a header from six yards out which he sent over the crossbar, but give Dortmund an inch, and they take a mile. That is what happened in the space of three minutes, first with Nuri Sahin drawing a fine save out of Daniel Davari courtesy of a curling free-kick, which was destined for the top right-hand corner. Marco Reus and Robert Lewandowski then tore through the defence to set up Aubameyang, who obliged in opening the scoring with a simple close-range header. The same combination led to the same result just before half-time, but the linesman's flag cut short Aubameyang's celebrations this time as it was the hosts who were more relieved to hear the half-time whistle, in spite of their bright beginning. Braunschweig made yet another bold start to the second half, this time earning their reward with Kessel's equaliser, as the right-back made the most of being unmarked to tuck the ball past Weidenfeller, who tried but failed to keep the ball out. It was Braunschweig's turn to switch off in the defence next with Aubameyang left in space to the left of Reus, who served the Gabon forward for his 11th goal of the season, taking him level at the top of the Bundesliga scoring charts with team-mate Lewandowski and Hertha Berlin's Adrian Ramos. If there is anything Dortmund have learned this season, it is that a one-goal lead is a slender one. Marco Reus tried to give them more of a cushion with a dipping free-kick which Davari turned onto the crossbar, before again wasting a good one-on-one opportunity. Their lead remained precarious, however, and another corner almost led to a second equaliser, only for Hochscheidt to be denied by Weidenfeller. With two minutes remaining, Henrikh Mkhitaryan spurned the next chance, hitting the outside of the post with only Davari to beat, and it nearly proved costly as Bicakcic turned a header onto the inside of the post at the other end. However, Braunschweig were not to get their fairy-tale ending as Dortmund hung on to end their four-game winless streak.